Sponsorships for individual events cover plaques for the top three individuals, pins for the top eight individuals and plaques for individuals placing first in each district. Sponsorships for team events cover plaques for the first three teams and plaques for teams placing first in each district. Travel Scholarships are provided for for State-winning teams and individuals to compete at the 2017 National FFA Convention. 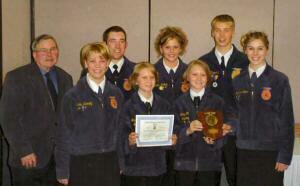 Extemporaneous Speaking – District and State Level awards and travel scholarship sponsored by SD Farmers Union. All State Parliamentary Procedure Awards are sponsored by Jeff Skinner, Skinner Financial Services. FFA Creed – District and State Level awards and travel scholarship sponsored by Craig & Bonnie Dybedahl and Jeremy & Lalura Nettifee. Marketing Plan – District and State Level awards sponsored by Legend Seeds, Inc., travel scholarship sponsored by Hurley & Associates. Agricultural Broadcasting/Journalism - District and State Level awards sponsored by Ludens Inc.